One of the best presents the Colorado Ballet received this year was given long before Christmas, when they agreed to partner with Kroenke Sports Enterprises (the owners of the Nuggets and the Avalanche) to present The Nutcracker ballet at the newly-renovated Paramount Theatre for the next 10 years. One of Denver's few remaining Art Deco cinema palaces, the Paramount now shines in its original splendor following a $2 million makeover. Among the improvements to the facilities are: a doubling of the stage, which is now thrust into the audience; the addition of an orchestra pit, chiseled from the concrete floor especially for the ballet; and improved sight lines from the now close-in balcony. 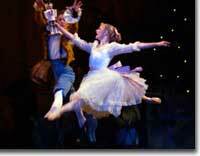 As a result, the ballet never looked or sounded better, with nary a bad seat in the entire auditorium. The game plan for Tchaikovsky's masterwork (and the company's biggest money-maker) has also been adjusted as a result of this marriage of classical art and popular entertainment. Forty minutes has been trimmed from the running time, bringing the show in at two hours, including a too-long 25-minute intermission, and Director Martin Fredmann has triple-cast the principal roles in order to avoid damaging his talented ensemble with a schedule of 29 performances in 30 days. For the most part, the company pulls off this feat with aplomb. On the Thursday evening of this performance, Dana Benton and Masahiro Momose, as Clara and Fritz, began the festivities with lightfooted teasing and pestering worthy of their archetypal sibling rivalry. Drosselmeyer's power of illusion, always wondrous in the hands of Gregory Gonzales, seems magnified by the intimacy of the new venue. The Columbine and Pierrot (Janelle Cooke, Nathan Vander Stoep) and Nurse and Soldier (Maya Makhateli, Jesse Marks) dolls are as charming as ever. Following last year's approach, the battle between the forces of the Mouse King and the Nutcracker Prince is exciting without being threatening. 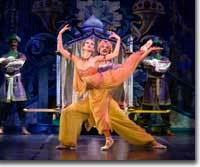 After Drosselmeyer intervenes to revive him, Miguel Castro proves a strong Nutcracker Prince, repeatedly lifting Clara with ease as she dreams her way toward the Kingdom of Snow. Then the Crystals, joined by the Snowflakes, build an enchanted atmosphere as the always marvelous snowfall intensifies. In the Land of Sweets, Sharon Wehner is silky smooth as the Sugarplum Fairy, complimented by the effortless moves of Chauncy Parsons as her Cavalier. The Chinese dance (Masahiro Momose) is bright and comical, and the dragon especially playful; the Arabian dance is ethereal and rapturous, with the transcendent Maria Mosina and magnetic Hua Zhuang; the Russian (Staci Kinkead, Misha Bobchinsky, and James Hernandez) is athletic and explosive; and the Mother Ginger delightful, with precocious work by the young dancers. Missed however were the Spanish and Marzipan dances, unfortunate victims of concessions to the clock. Finally, Parsons, fresh and light, and Wehner, precise yet fluent, return to charm us, just before Drosselmeyer rises from his throne and pulls the curtain over his illusion. The orchestra, this evening under the baton of Assistant Conductor Ritsuko Shinozuka Kubo, brings alive the magic in Tchaikovsky's unforgettable score. 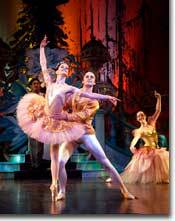 The Colorado Ballet's always dazzling The Nutcracker runs through December 28th. 303-357-ARTS (2787).